At least that’s how I like to describe Sabeen’s latest nail experimentation. 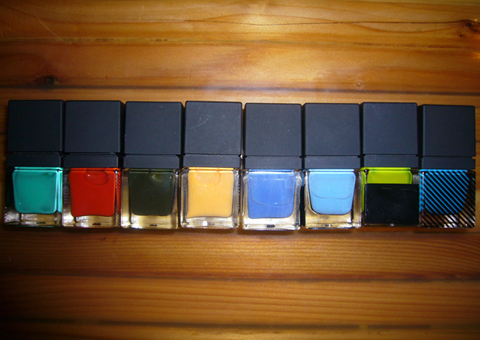 We recently went to Urban Outfitters and found a line of nail polish with some really interesting variation of colors — grays, neon yellow, brown, greens etc. They didn’t have a brand name and each shade was only assigned a number. The only place I could find anything on it was this Canadian blog. 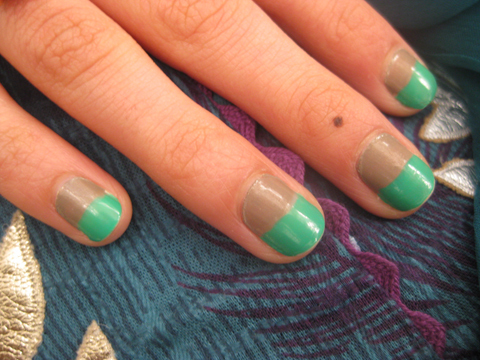 Anyway, I promise there’s a point to this story: Sabeen used the bright green color from that line and her beloved Sephora by OPI Under My Trench Coat to make this design here. I’ll have to find out if the line has an actual name or not, but I believe they should be at all Urban stores. Great. I just did my nails and then saw those stripes. And now I feel like I accomplished nothing by painting mine plain red. cool, i found a website i think yu would loveee. STRAIGHT FROM JAPAN ! Pingback: Beauty and the Feast » Blog Archive » Vote for Sabeen!